Belief that the Deafs and their families have a fundamental right to accessible services in all aspects of their lives and the recognition of Deaf Excellences. Membership of the Association shall be open to any Deaf national of Nigeria whose age is not below eighteen (18 years and who is not a primary school pupil. “Deafness is defined as a person in whom the sense of hearing is not function for the ordinary purpose of life. Honoraria membership may be conferred on hearing individuals either Nigerians of foreign in recognition of an appreciable service to deaf people in Nigeria. Distinguished Nigerian individuals of high ranking public officers recommended by the executive committee and with the support of a majority of members at a general or emergency meeting of the Association may be invited to be Patrons. Validity of membership. No membership shall become valid until the appropriate entry fee has been paid. NNAD is a non-profit Organisation established to serve as means of interaction with the Federal, States governments, local Governments and Non-Governmental Organisation in matters concerning the deaf people in general. To act as avenue of educating the public on deaf and deafness through any available means, e.g. Seminars, advertising and others. To act as a forum for the exchange of information and useful ideas among deaf people both nationally and internationally. To convene of participate in conferences and or seminars designed for the benefit of deaf people. To sponsor qualified deaf Nigerians for specific training if the financial strength of the Association permits of seek external aid to meet the cost of the training. To act as liaison between private agencies, government establishments and individuals and the deaf community in matters relating to deaf people such as management of trustee funds, vocational rehabilitation of deaf people, job placement of qualified deaf people, etc. To aid in the establishment of educational standards for deaf people in Nigeria. To provide counseling services to families of deaf and the Association deaf in any area in which the Association in area in which the Association is capableTo acquire by purchase, lease of other wise any property the Association thinks necessary for the furtherance of its programs. To establish business ventures to provide employment to deaf people and to generate funds for the administration of other programs of the Association. To provide or aid in providing interpreting services to deaf people all over the country through involvement of Government where possible. To obtain and maintain relevant statistics regarding the Deaf. To advance and promote the concept of the deaf people of Nigeria as a distinct linguistic and cultural entity. Provision of access to health for deaf people. To work closely with the legislators in order to persuade and influence them on the need for improved access to legislative proceeding for the deaf citizens. This is with a view to have deaf representatives in the senate, House of Representatives and House of Assemblies of the Nation. To effectively promote family life and recreation for the deaf. Establishment of welfare trusts to accommodate parents/child relationship. The scope of the Association shall be throughout the federation of Nigeria and shall extend to other international organisations, agencies of groups that share common goals with the Association. 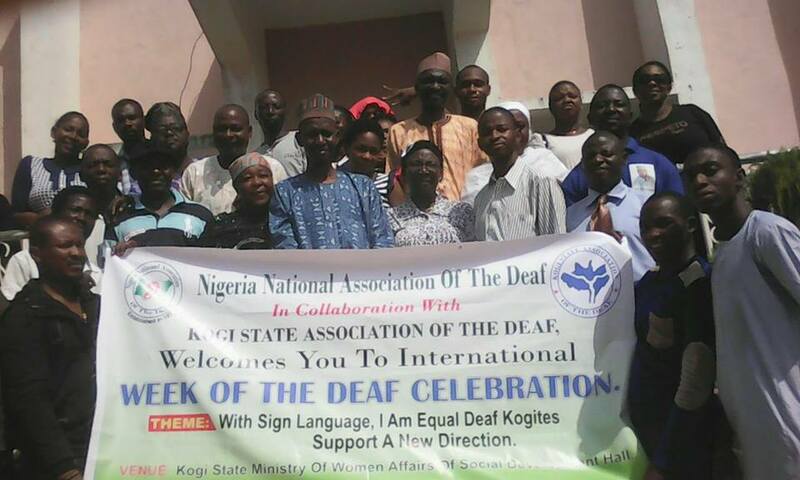 Nigerian Deaf Associations outside Nigeria shall get affiliated with NNAD.